I have always loved doing jigsaw puzzles. Call me weird, but there is something satisfying in the sorting, assembling, and creating a picture that you enjoy. As an adult, I've brought my puzzle hobby into the office. I work with children. Children love to soak up adult attention - not always obviously, but trust me, they want our attention. And the children I work with seem to speak more freely if we are fidgeting with something rather than me sitting still and making constant eye contact. A good puzzle is not only fun for me, but is often helpful and fun with them. A great puzzle is even better. I am always on the look out for excellent puzzles and in this review, I will share some of the puzzles I consider to be excellent. Over the years I have found some puzzles to be too fragile or too frustrating. Sometimes the paper and cardboard peels apart while the children are trying the pieces in different spots. Other puzzles have a poor "photograph" or color quality and it is nearly impossible for the children and I to get it put together. Some puzzles end up never being completed and being either donated or tossed into the trash. For these reasons, I am on the look out for quality jigsaw puzzles. I have found that Ravensberger creates quality puzzles. The previous two puzzles that have been on my table were real stinkers. Too difficult to complete due to color quality. 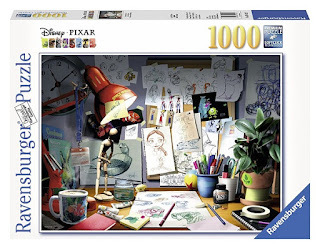 So it is exciting to be working on this Disney Pixar 1000 piece puzzle. I was introduced to the Ravensberger brand by Treasures by Brenda and am enjoying this puzzle very much. It is made of quality materials (it is not peeling apart), the pieces are solid and thick, and even though the colors are very similar in portions of the puzzle, it is not frustratingly difficult to put together. Many children like to draw, so this theme has been interesting to them. 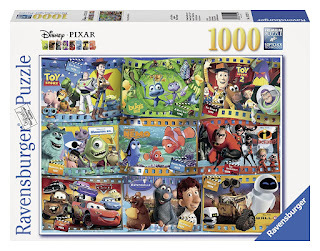 This 1000 piece jigsaw puzzle is the next in the line up. I chose it due to the variety of Pixar celebrities that are included. The older children may initially behave as though it's too "baby" for them, but I know they will work on it anyway. The younger children will like it. And what a great way to start a conversation than by asking which of the movies shown are their favorite. And why. Children aren't often asked their opinions. It is meaningful when you genuinely ask and want to know. Beverly recommends Susan Wingate jigsaw puzzles. She shows us several examples of the pretty garden and country living artwork. Beverly gives personal reasons why she enjoys puzzles in general, and these puzzles specifically. I have to agree, the Susan Wingate puzzles are beautiful. Barb's love of California shines through her review of puzzles of California. As a native Californian, she shares samples of Zazzle puzzles created from her travel photographs as well as manufactured state puzzles that are available. If you love California you should read her California puzzles review. Speaking of creating puzzles from personal photographs, Mary Beth explains how she does this on Zazzle in her article Create a Puzzle from a Favorite Photograph. Whether you are interested in her fantastic lighthouse puzzle collection or in making your own puzzles, her article is helpful. And when you have finished your puzzles, you may choose to glue them together and hang them for display. I love this idea and would do it, except that I cycle through my puzzles at work and we put them together more than once. Beverly reviews puzzle glue that she has used with success. I have always loved jigsaw puzzles from childhood to today, Dawn Rae. And, I agree, a puzzle with solid pieces and good colors are so much nicer to work with, especially if you plan to put together a puzzle more than once. Neat that you can combine your work with children with a fun activity like putting together a jigsaw puzzle. What a wonderful idea! I used to enjoy jigsaw puzzles, but it has been a really long time since I sat down to actually put one together. I love the idea of doing it with someone else and spending that time with each other chatting over the puzzle. My son and I have done that with Legos, same concept, different kind of puzzle. However, I can easily imagine working on a puzzle with other adults and definitely with children. I know the children you work with must absolutely adore you Dawn. You are always searching for ways to get in touch with them without being overly intrusive and making them feel uncomfortable talking to you. btw, I definitely agree about buying quality puzzles. I very much remember the puzzles that would separate into layers and tear apart too easily. I used to love working jigsaw puzzles but haven't had time or little people around to work them with in years. Working puzzles is a social activity to me, but were I living alone and not as busy as I am now, I'd probably start working puzzles again. It sounds as though the Ravensberger puzzles would be challenging enough to spend some time with and sturdy enough to outlive me. Thanks for a great review and for mentioning the other puzzle reviews here, including my California Puzzle review. It seems a lot of us here like to work puzzles. Love a good puzzle! Thx for the tips! One of my favorite family photos, one that is displayed prominently in our home, features my two sons working a jigsaw puzzle together. Thing is, the picture was taken just a couple of years ago when "the boys" were around about 29 and 32 years of age. Our immediate family (six adults) vacationed together that year and my very wise sister-in-law set up a table and puzzles to help family members of all ages pass the time. What a great way to bring families together! 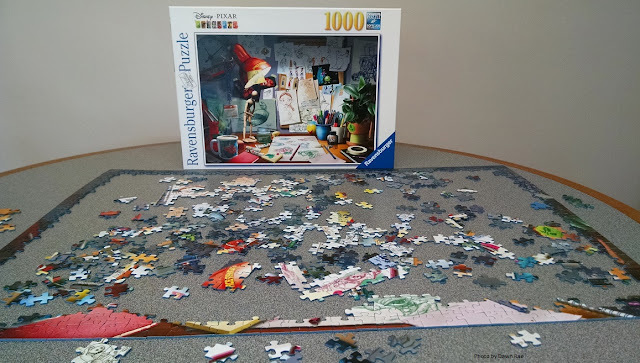 As for the quality of the puzzle, I don't even remember in this particular case, but I know that I've purchased Ravensberger jigsaw puzzles as gifts and the colors are vivid and happy. Definitely a good choice! you've put me in the mood to do a puzzle now! I always admire people who have the patience to do jigsaws. It seems like a great pastime.